Kit Kat Kate & The Contest Winners! Meet Sarah Kate, also known as Kit Kat Kate. She's one of the three long-term inmates I rescued from the pokey back in December. She's small and sweet and has a little squeak of a meow. She's best buddies with panther-like Mr. Midnight (photo of him coming soon), loves to play, and graciously acts as alarm clock in the morning if you should foolishly attempt to sleep in. My mother fell in love with Sarah Kate during her recent visit, and, when not calling her Cuteness or demanding that her official name be changed to Kit Kat Kate, she was threatening to sneak her off the farm and back to California in her carry-on bag. Sarah Kate's current favorite way to pass the time is to go in and out of The Shack about 90 times a day (via the homemade shredded-screen cat door so kindly created by The Doodle Monster), probably because she spent 8 months of 2007 in the slammer. It's hard to believe that in all that time nobody wanted to adopt her. I just love her to pieces. Sadly there are millions of unwanted and homeless dogs and cats in this country, but thanks to the extraordinary efforts of artist and animal lover Bernie Berlin, that number continues to get a little smaller each day. For the past 8 years, Bernie has been running a full-time, non-profit animal rescue in Tennessee called A Place To Bark. . . And Meow. A Place To Bark is a 501c3 non-profit organization funded entirely by donations and Bernie's own personal money. Last year alone, Bernie rescued and found homes for over 500 unwanted animals, many of whom were abused or injured. At times she has 50 or more dogs in her care. She literally goes to the pound and takes home dogs who are scheduled to be put down the next day. And somehow she miraculously has time to share her heartwarming and heartbreaking experiences on the A Place To Bark blog. I think Bernie is one of the most wonderful people in the world, and thanks to the generosity of a whopping 2,400 animal lovers like you who made donations during January's America's Giving Challenge, Bernie will now be able to build a much needed shelter building on her property. While A Place To Bark didn't win one of the four $50,000 America's Giving Challenge grants (so close in 5th place! ), Bernie and the animals were still big winners. A Place To Bark received over $42,000 in donations, and the Zoline Foundation awarded her a matching $35,000 grant. The shelter building is going to become a reality, and Bernie will no longer have to bring dozens of dogs into her house during the winter. Many, many thanks to all of you who made donations to A Place To Bark after reading my post about the challenge (and our newly adopted cat Topaz, who is doing great by the way) on Farmgirl Fare. 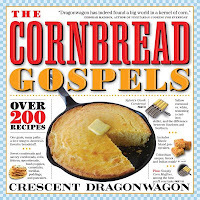 The winner of the signed copy of The Cornbread Gospels is Cyndee, who has 2 cats, 1 dog and 4 chickens - all adopted. The phone call from this foodie farmgirl will be going to Jeannine, who has a Cat Chalet on her front porch that is open to the local strays. Congratulations! I'll be giving away another signed copy of The Cornbread Gospels soon (this is such a fun book), as well as several other neat new books, so stay tuned. In the meantime, if you're thinking of adding a new furry family member to your household, please consider adopting one from a shelter or animal rescue organization. It's a win-win situation for everyone. And if you're looking for a new pet charity to support, I hope you'll remember Bernie and A Place To Bark. Every penny makes a difference, and 100% of your tax-deductible donation always goes directly to helping the animals. Thank you! © Copyright 2008 FarmgirlFare.com, the award-winning blog where just because a houseguest looks around The Shack and says, "There are cats everywhere!" doesn't mean you have too many - and I'm so grateful for each and every one. I have been a faithful follower of Bernie's since I heard about her on your blog. Considering today's entry on her blog, I am so very hoping that the 2 pups you have are rescues!! I love the blog, it gives me a little "farm break". Bernie is amazing, I'm working on a quilt she can auction off in september, I don't know how she does it all. So funny how the blogs interlink. I read yours and Bernie's daily, and love them both. Both of you are great! Thanks for all of the wonderful entertainment. All of my animals are from the slammer (1 lab -1 who is also no longer with us - and two cats). They love us so much - it's a different, stronger, appreciative kind of love isn't it? Sometimes I just go visit a shelter just to pass around some lovin'. I have a hard time not bringing them all home with me. Yea I loved reading about the adopted animals. I just blogged about our newly adopted cat. I'm so excited--just saw on the blog that I won the phone call! And I normally never win anything! Thanks Susan, looking forward to talking to you! If you haven't read my blog today, take a peek something really, really exciting!! Take care and I will try to call you on Thursday, while transporting to Chicago.